INDUSTRY.co.id - Lembang West Java - Minister of Agriculture, Andi Amran Sulaiman, conveyed this, before the Horticultural Farmers Community, at the 2018 Horticultural Spectrum event, in Balitsa Lembang, Thursday / 20/09/2018. Minister of Agriculture, complaining about the present, many irresponsible issues related to development activities, in the agricultural sector. We are not playing games, there are many ASNs, in the scope of the ministries being dealt with, when there are allegations, things went wrong, we immediately suspended and were dislodged from their positions, if proven guilty, immediately fired, even just an allegation, we were dislodged, there 1300, ASN is enclosed in the Ministry of Agriculture, which is acted in the form of revocation of office, demotion or transfer, to dismissal, even if it is proven that there is one rupiah, entering the minister's pocket, we will immediately resign, said the minister. 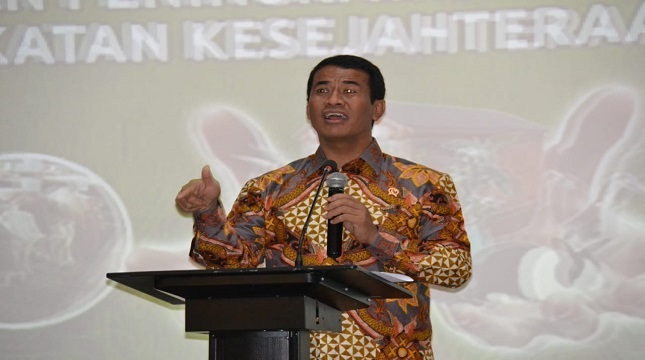 The Minister of Agriculture, added that currently, the agricultural sector, began to look at our "Young Generation", because the Jokowi-JK Government, loving Farmers, through various assistance in production facilities, irrigation and alsintan, did not play games, the results were proven. In the past, agricultural commodities that were always imported, had now left behind and returned exports, such as corn, shallots, and in fact so far many of our horticultural commodities that already exist in the export market, you can see here, we have penetrated 11 countries and 2018, the agricultural sector contributes 24, 47 percent of National GDP, Minister of Agriculture said. Minister of Agriculture, when giving a speech, invites, some Young Farmers, dialogues and invites Young Generation, to engage in Farmers' Business, if you want to succeed, be Prtani because 8 out of 10 Indonesian conglomerates come from the Agriculture sector, do not hesitate, the Ministry of Agriculture will support various technologies and superior varieties, only with technology if you want to advance the agricultural sector.